Vivid, beautiful use of colors, and high quality! This artist is truly amazing and the story that can be told by having multiples of his beautiful paintings is wonderful. The artwork is crafted with 100-percent cotton artist-grade canvas, professionally hand-stretched and stapled over pine-wood bars in gallery wrap style - a method utilized by artists to present artwork in galleries. I purchased a 12 x 8 very small but it is so lovely I will be purchasing additional artwork from this artist. It was delivered quickly and is beautiful. Gorgeous. Rich colors and interesting textures - better in person and is a definite WOW in our living. Romantic and beautiful. Highly recommend! 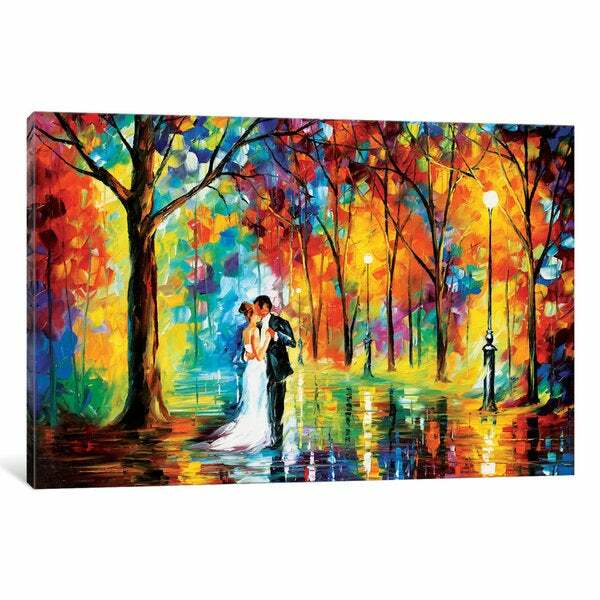 I absolutely love this painting!